The transverse ellipticity is crucial for light to experience transverse MO effect. Only light, which transverse ellipticity is close to circular, may experience significant transverse MO effect. The following describes conventional polarization of light, which light may have when it propagates through a bulk material. In cases of a=1 and a=-1, the polarization is left and right circular, respectively. In cases of a=0 and a=infinity, the polarization is linear. In all other cases, the polarization is elliptical. Only light, which polarization is transverse elliptical, may experience the transverse MO effect. Since an electromagnetic wave is transverse and transverse elliptical polarization clearly has a component along propagation direction, it seems that such a polarization is forbidden. However, there is one special case when such a polarization is possible. It is the case when light has an evanescent component along the direction perpendicular to the wave propagation direction. Light may have the evanescent component when it propagates in vicinity of an interface between two different materials. The ratio (4) is similar to the ratio (1). If the ratio (1) describes conventional longitudinal ellipticity of light, the ratio (4) describes the transverse ellipticity. the polarization is circular and the wave will experience strongest transverse MO effect. It is because in the case when the polarization is circular and the axis of polarization rotation is along the magnetic field, light will interact only with electrons of one spin direction and therefore experiences the strongest transverse MO effect. From Fig.2 it is very clear, that wave, which polarization is transverse elliptical, has polarization component along propagation direction. How it is possible? Electromagnetic wave is transverse and should not have longitudinal component of polarization!! and for the wave (2) it is along z-direction, along which the wave has a polarization component. It is interesting to known how large the transverse ellipticity in known cases when the transverse MO is experimentally observed. 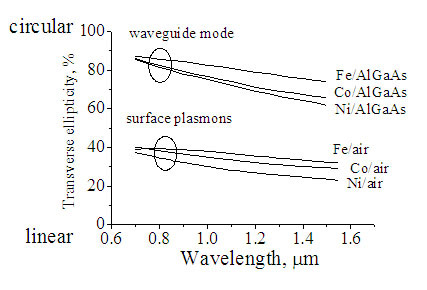 Figure 4 shows calculated transverse ellipticity in cases of a waveguide mode propagating in Fe/AlGaAs, Co/AlGaAs, Ni/AlGaAs waveguides (buffer Al0.5Ga0.5As(300 nm)/core Al0.3Ga0.7As(1200 nm)/ clad Al0.5Ga0.5As) and in cases of a surface plasmon propagating along Fe/air, Co/air, Ni/air interfaces. In all cases the traverse ellipticity is significant. The ellipticity is close to circular for the waveguiding mode. That is the reason why the experimentally observed transverse MO effect in waveguides is substantial. In both cases of the hybrid waveguide modes and the surface plasmons, the transverse ellipticity is substantial. Fig.4 Transverse ellipticity of waveguide mode propagating in metal/AlGaAs waveguide and surface plasmon propagating at metal/air interface. 100% corresponds to a circular polarization. The upper and lower insets show the optical field distribution of a waveguide mode and a surface plasmon, respectively.